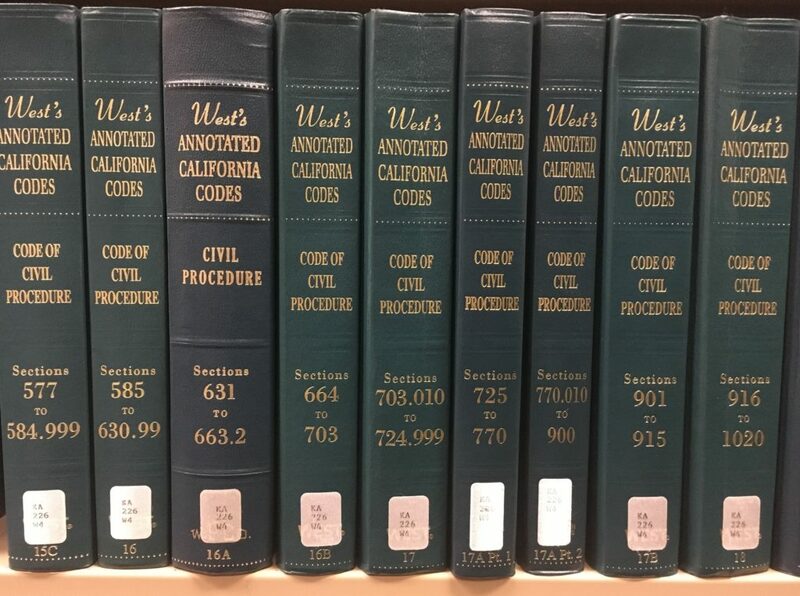 The Law Library’s robust 70,000 volume collection consists primarily of California and Federal statutes, codes, cases, regulations, practice materials and research references. In addition we support a self-help collection, including a variety of Nolo titles, designed to assist non-attorneys working on their own legal matters. The Law Library offers CEB Onlaw; Westlaw; Lexis/Shepards Online; and Hein Online access within the law library. See Online Resources for more information about these databases. The EBSCO Legal Information Center is available inside and outside the library. It offers online access to Nolo and other self-help titles. Click here for access. The Law Library provides ten public computers with access to the Internet and Microsoft Office Suite for the convenience of library patrons. Printing is available for 15¢ a page. Please note our computer use policy. The Law Library offers free public wi-fi. Please see the front desk for a password. The Law Library offers two public copy machines. Copies are 15¢ a page for letter-sized and 25¢ for legal-sized copies. The Law Library has a fax machine. Current rates to send: $2.00 for the first page, and $1.00 for each additional page in the 805 area code and toll-free numbers. For faxes outside the 805 area code but within the United States, the charge is $2.00 for the first two pages and $1.00 for each additional page. No international faxes. A cover sheet is provided free of charge. Cover sheets do not count towards the total. Current rates to receive: $1.00 per page. The Law Library is able to scan pages into .pdf format. The charge is $1.00 per page. Some office supplies (envelopes, etc.) and flash drives are available for sale. See staff for prices. The Law Library sells a limited number of superseded and/or discarded titles. Charges are generally $5.00 + tax for a single title and $10.00 + tax for a set. Other prices are as marked. Donations of legal titles in good condition are accepted during open hours. The primary mission of the Ventura County Law Library is to provide citizens of Ventura County access to legal reference materials on state, federal and international statutes, case law and supporting materials. The Library does provide guidance and direction to selected legal sites from its web page. With the help of an InFoPeople grant from the California State Library, the Library offers public access to the Internet. Users are expected to use the Internet in a responsible manner and follow all Library rules established for its use. The policies stated here are designed to ensure easy access to the service by all patrons. Public access to the Internet is provided for the purpose of legal research and/or obtaining government document information. Accessing games, chat rooms, social networking, and other similar sites will only be permitted on the 30 minute computer stations. Uses inappropriate to the Library’s purposes will not be permitted. Only the use of web-based e-mail is allowed. Patrons cannot download any outside applications (such as Microsoft Outlook) to the computers. Parents of minor children assume responsibility for their children’s use of the Internet. The Library reserves the right to impose time limits on the use of the public Internet computers. Library staff may provide limited, basic one-on-one instruction in the use of the Internet, not to exceed 10 minutes. Library staff is not required to assist with forgotten passwords, more complicated computer functions, or conduct computer transactions for a patron (e.g. emailing, filing online applications, document preparation, or personal projects). Printing from the Internet is allowed at .15¢ a page. The Library has only black and white printers. Downloading/saving is allowed to the G: Public drive only. Users may not download or save anything to the hard drive or use their own software on the Library’s computers. Internet access shall not be used for any illegal purposes. The Library is not responsible for an individual’s violation of copyright laws regarding materials found on the Internet. Misuse of Internet access or computer equipment shall result in the loss of computer privileges. Unfortunately, not all sources on the Internet provide accurate, current or complete information. The Ventura County Law Library is not responsible for any damages, losses, or invasions of privacy related to the use of the Internet.